Is the most ordered comic book since 1997 getting a second printing? You better believe it. The centennial issue of the popular post-zompocalyptic comic book has proved to be a stunning huge event comic. In fact, it's the biggest comic book since the heyday of the mediums 'gold rush' back in the mid-nineties. A staggering 383,612 copies of the book were ordered (and sold) by comic book stores and the like last week. Issue 100 chronicles a major turning point in the lives of main character Rick Grimes' group of survivors- and it's getting high praise. 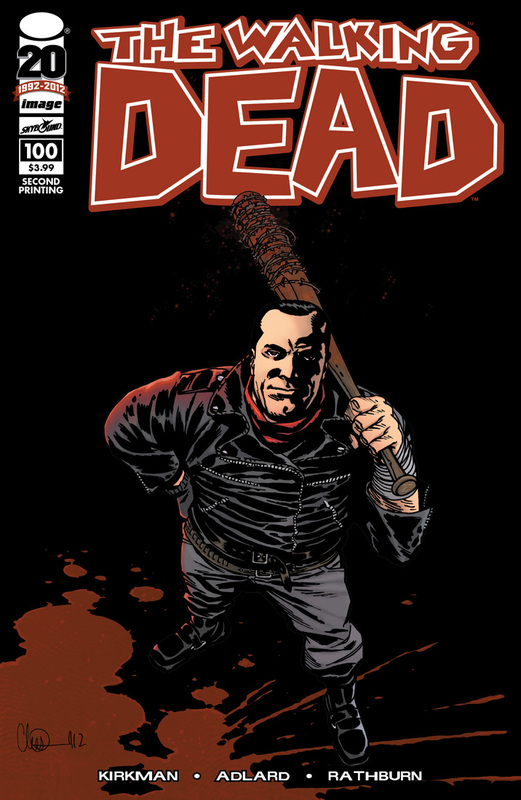 A harrowing and heart-wrenching event in the lives of Rick Grimes and his band of survivors, THE WALKING DEAD #100 has been critically acclaimed for its examination of violence and mortality. At The Comics Journal, Sean T. Collins considered the depiction of brutality: "It's hugely graphic and gory, but more importantly it's predicated on anguish and agony, on a character begging for their life and slowly losing it anyway, in view of other characters, including children, made to watch as punishment," he wrote. "A 'bad guy' is committing the violence, but its horribleness is quite of a piece with the series' presentation of human-on-human violence overall." Augie De Blieck, Jr. at Comic Book Resources wrote, "[T]his issue delivers. It is not, however, the massive rampage of blood and guts I expected it to be. Robert Kirkman and Charlie Adlard deliver something much smaller, but just as effective, creepy, tense and sad." The issue inspired Bleeding Cool's Adi Tantimedh to ponder the function of tragic fiction in society. "I wonder if the popularity of THE WALKING DEAD and the zombie apocalypse genre is a kind of atavistic ritual that the culture is partaking in to magickally ward off the worst that could happen, which is societal collapse into full horror," Tantimedh wrote. "...[T]he proxy of fiction allows the audience to mentally put themselves through the horror to find catharsis and feel more secure after the experience." Look for the second chance issuance on store shelves soon with alternate cover art by Mr. Adlard himself.